The beautiful village will have the merriment, the music, and great vino, too, on St. Patrick's Day Eve. A parade a community celebration, food, beverages, and a blithe spirit? That's all flowing through Murphys on Saturday, March 16, 2019. SATURDAY, MARCH 16: That's the 2019 date for Murphys Irish Day, a daylong lark that includes a pancake breakfast, oodles of booths selling crafts and such, and a parade that's straight out of a movie, if the movie was set in a village as picturesque as Murphys. 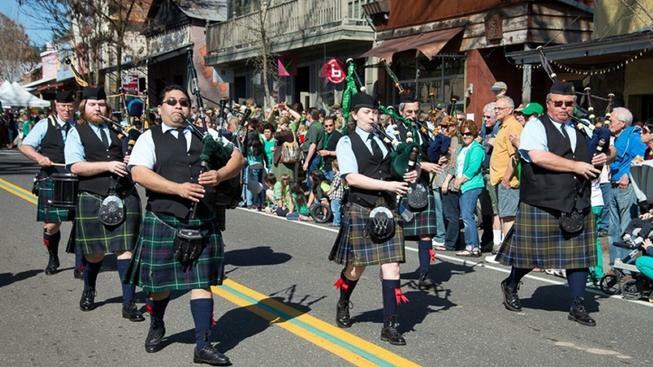 Listen for "the swirl of bagpipes" at 11 in the morning, which signals that a whole procession of ponies, vintage cars, marching bands, and more are about to saunter, with pomp, sound, and dash, through the heart of the town. It's free to see, of course, but you'll want money, and a designated driver, if you plan to visit all of those wine-lovely spots. Of course, a lot of other people will be in town to do just that, so don your green hat early, and arrive early, and, if you can, stay a night or two in this marvelous Mother Lode location.